← How to print Photoshop PSD file to PDF file? How can I convert my pdf file in Japanese to PowerPoint? 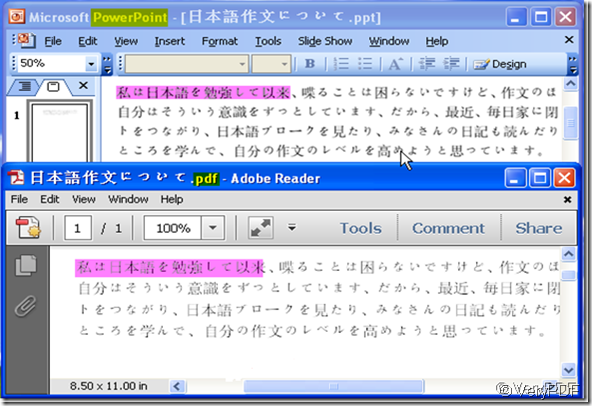 PDF to PowerPoint Converter can help you convert your pdf file in Japanese to PowerPoint. PDF to PowerPoint Converter is a very helpful tool for you guys finish converting form pdf file to many other form files such as ppsx, pptm, pptx, pot and so on. 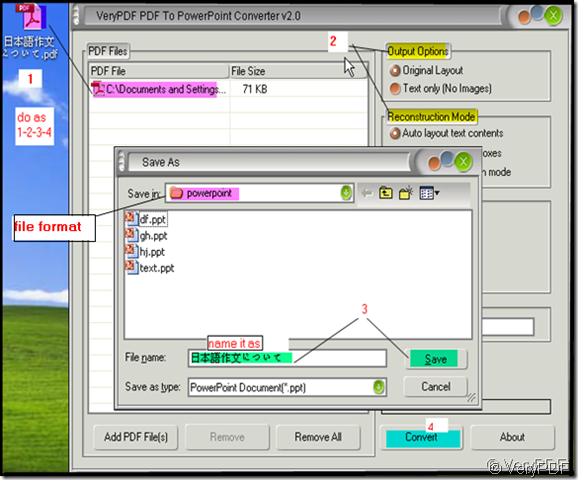 PDF to PowerPoint Converter itself is in English version but it surpasses the language obstacle. No matter the pdf in what languages, it can convert the pdf file to relevant language PowerPoint. 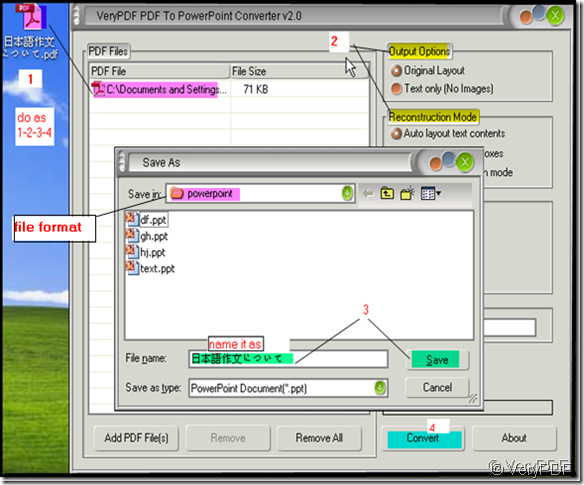 When VeryPDF researched this software, it customized this specific function. It supports English, French, German, Italian, Chinese Simplified, Chinese Traditional, Czech, Danish, Dutch, Japanese, Korean, Norwegian, Polish, Portuguese, Russian, Spanish, Swedish, etc. languages; Most of guys will worry that after converting, it will have mess code in the PowerPoint file. On the contrary, PDF to PowerPoint Converter can finish converting tact. But it will have some exception. Such as the source file in the pdf file has no grammar mistake, but it has many red wavy lines in the converted PowerPoint. That means it has grammar mistakes after converted. Actually It does not have any mistakes in the converted files. The problem lies in that you need to adjust the language in the PowerPoint . If the PowerPoint does not support this kind of language there will be red wavy lines. A lot about the trouble you will meet when using, has been stated above. Now I will show how to get it and use it. I will take an example for illustrating. Enter the interface and add Japanese pdf file to it. Two ways of adding files in picture 2 .I downloaded a pdf article named “日本語作文について” in Japanese then I will convert it PowerPoint. picture 2. And follow the steps 1-2-3-4. Then I got a file having the same content with pdf file in PowerPoint. Then you can compare them like picture 3. How to convert MS Office Word documents of doc to wbmp?